…Ready to plug some words where they belong? 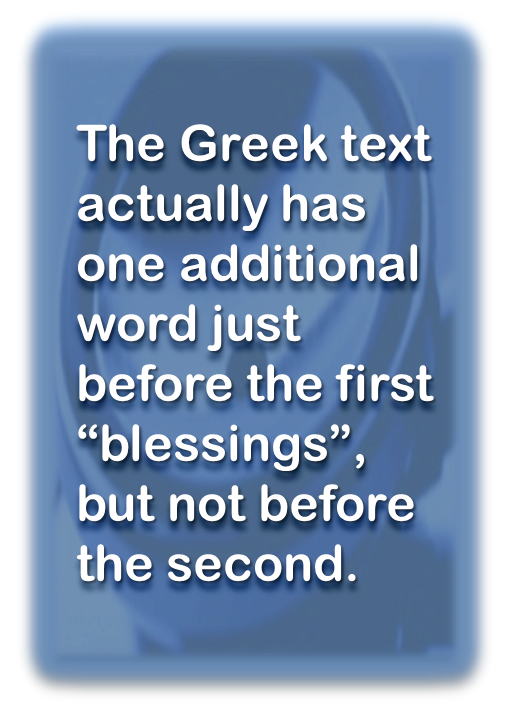 Ready to read “blessings” instead of “bountifully” or “generously”? Here we go! Click here for part 2. 2 Corinthians 9: 6 – He who sows sparingly will also reap sparingly, and he who sows “blessings” will also reap “blessings”. Now that we did it, let us examine the verse for a minute. Read it carefully, and you will probably realize that it is not structurally correct. That is because the first part, using an adverb (sparingly) speaks of how (how…much?) to sow, while the second part, using a noun (blessings) speaks of what to sow. In other words, as currently written, one can easily make the argument that it is possible to sow blessings “sparingly”, which would readily highlight the problem with the structure of this sentence. 2 Corinthians 9: 6 – He who sows sparingly will also reap sparingly, and he who sows “epi” blessings will also reap blessings. 2 Corinthians 9:6 – He who sows sparingly will also reap sparingly, and he who sows on the basis of blessings will also reap blessings. Now this sentence is structurally sound, because the two parts speak of the same thing: how to sow! How amazing! And in case you wonder, we shall see that it is not “how much” either. So what are we seeing? All three bible versions (and may be more) not only changed a word (blessing), but also deleted one (on the basis of)! We have a double jeopardy, yay!! The meaning of the second statement (…and he who sows on the basis of blessings will also reap blessings) could not be more different than what these bible translations and church leaders would have us believe. It is clear that it is the motivation behind – or the basis for – the sowing that is the focus here. What a difference a seemingly insignificant 3-letter word can make! By itself, it confirms that the motivation, the motive, the intention, the basis, the attitude, etc. is what is of concern in this verse. Now therefore, a plausible paraphrase of the second part could be…he whose motivation to sow is that it will bless someone will himself receive blessings in return. The quantity that is to be sown is not at all being referenced here…and guess what…it does not need to be! Why? Because if the other instances of the word eulogia such as in Galatians and Hebrews (as discussed in part 2) are any indication, the very fact that the sowing is performed on the basis of blessings automatically implies that the “right” quantity will be given. By the way, here is how the amplified bible (AMP) cleverly puts it. 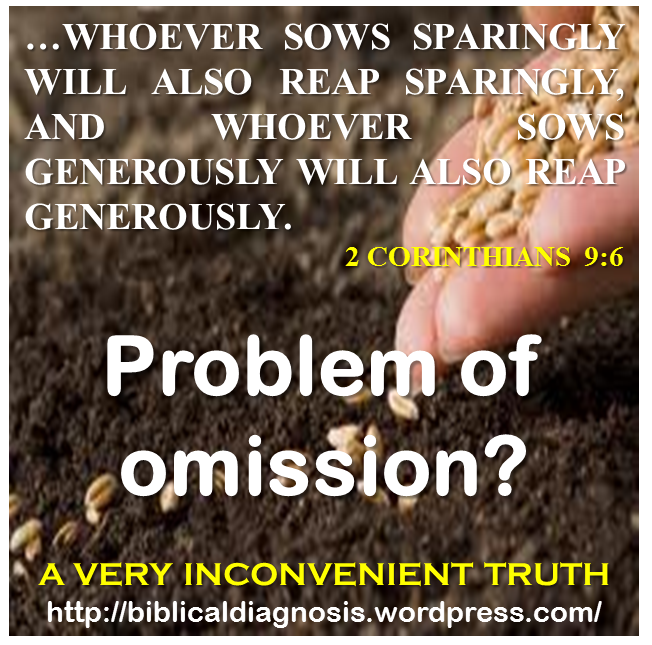 2 Corinthians 9:6 – …he who sows sparingly and grudgingly will also reap sparingly and grudgingly, and he who sows generously [that blessings may come to someone] will also reap generously and with blessings. If you asks us, we see an attempt to reconcile these two views, by making reference both to the quantity, and to the way one sows…all in one sentence…clever huh?! Unfortunately, no matter how pleasing this may sound, we simply find no biblical basis for that. It is actually very clear that all these bible translators understood full well the need to have sentences that are structurally correct. Look. They used adverbs when changing the meaning of the noun eulogia. They used the adverb generously, not the noun generosity. They used the adverb bountifully, not the noun bounty. And to make all fit, the word epi simply had to be removed. Why? Because otherwise there are two choices: either one writes…on the basis of (epi) generosity, or one writes…generously. But these two statements are very different. The former clearly emphasizes the motivation, while the latter could certainly refer to the the quantity. They chose quantity (and our church leaders are the more happy for it), and epi had to go! Here goes the sad story of our little epi! So where does that bring us? To the first part of verse 6 of course. Now that we have restored the wordings in the second part, we may now turn to the first part…and there, sparingly sure sounds like quantity! Or does it…? The Amplified Bible translation really tops off your argument here–nice job! Yes it really does…thank you very much Ria! Actually epi appears twice in the verse. So wouldn’t it be: He who sows sparingly will also reap sparingly, and he who sows “epi” blessings will also reap “epi” blessings. Additionally, Jesus praised the widow because she gave it all. Amount and motive count. I appreciate your input since I am studying this verse. Thank you very much for commenting. You are cabsolutely correct, “epi” does appear twice and the interpretation you gave is correct. I think the interpretation you gave support the position I am giving in this series (if you can, also check the last two parts (4,5) of this series to see my full argument. My point is that there is no need to emphasize the quantity because a blessing must be of the right quantity to be a blessing, by its very definition. But what is a correct quantity? The example you gave of the widow is an excellent one. No one would have appreciated her giving precisely because the quantity was very small…insignificant actually in the eyes of many. But Christ detected that it was all she had…this spoke directly of her motive…the absolute amount was irrelevant, but her act proved that she was doing it properly…to bless. As opposed to the man who gave much more than her, but out of his abundance. Man would appreciate the greater amount the man gave because they look in absolute terms, but Christ appreciated the widow’s because it spoke of her heart. Therefore, my point is that quantity cannot be looked at from an “absolute” point of view. If your true motive is to bless, then God will see to it that you give the right quantity…and that quantity, perhaps only you and Him will know what it is at that time. I am interested about your comment about Epi being related to stewardship…very interesting. Feel free to share more if you are able. I appreciate your input Steve!